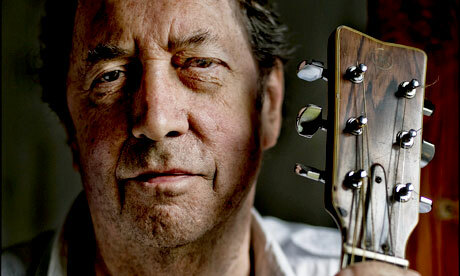 Bert Jansch, a leading figure in the British folk revival of the 60s and one of the most respected musicians of his generation, has died of cancer aged 67. A founding member of Pentangle, Jansch was also renowned as a guitar virtuoso and was sometimes hailed as a British Bob Dylan. Neil Young said: "With deep regret Pegi and I acknowledge the passing of Bert Jansch. Pegi and I were lucky to play with him on all of our shows for the last couple of years. He is a hero of mine, one of my greatest influences. Bert was one of the all-time great acoustic guitarists and singer songwriters. Our sincerest sympathies to his soul mate Loren. We love you Bert." Born in Glasgow on 3 November 1943, Jansch released 23 solo albums, the last of which, The Black Swan (2006), featured collaborations with Beth Orton and Devendra Banhart. He was the recipient of two lifetime achievement prizes at the BBC Folk awards – one for his solo achievements in 2001 and the other, in 2007, as a member of Pentangle. The band reformed in 2008. In June 2009, he discovered he had a golf ball-size tumour on one of his lungs following what was at first a routine visit to the dentist. Following treatment, he went on to co-headline a US tour with Young. Jansch had recently been forced to cancel a live show in Edinburgh due to ill health and was living in a hospice in north London at the time of his death. Those he influenced included Jimmy Page, Nick Drake, Graham Coxon, Donovan, Bernard Butler and Paul Simon. According to fellow guitarist Johnny Marr: "He completely reinvented guitar playing and set a standard that is still unequalled today … without Bert Jansch, rock music as it developed in the 60s and 70s would have been very different." Jansch told this newspaper last year: "I'm not one for showing off. But I guess my guitar-playing sticks out.